Kratom (Mitragyna speciosa), a naturally existing plant found in South-East Asia, is traditionally used as a herb to help elevate a person’s energy and also to treat numerous medical ailments. Other than the analgesic property, kratom has been used as an agent to overcome opioid withdrawal as it contains natural alkaloids, i.e. 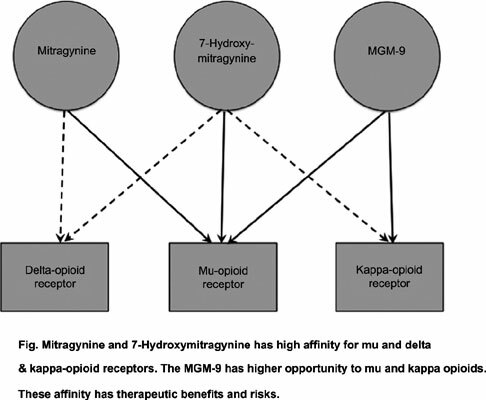 mitragynine, 7-hydroxymitragynine, and MGM-9, which has agonist affinity on the opioid receptors, including mu (µ) and kappa (κ). The role of neural reward pathways linked to µ-opioid receptors and both dopaminergic and gamma-Aminobutyric acid (GABA)-ergic interneurons that express µ-opioid receptors were deliberated. However, kratom has been reported to be abused together with other illicit substances with high risk of potential addiction. There are also anecdotes of adverse effects and toxicity of kratom, i.e. tremor, fatigue, seizure, and death. Different countries have distinctive regulation and policy on the plantation and use of this plant when most of the countries banned the use of it because of its addiction problems and side effects. The aim of this review is to highlight on the potential use of kratom, unique ‘herbs” as a substitution therapy for chronic pain and opioid addiction, based on the neurobiological perspective of pain and the underlying mechanism of actions of drug addiction. Ketum, kratom, mitragyna speciose, mitragynine, 7-hydroxymitragynine, opioid receptors.